Machi-ya is an odd name for a Japanese restaurant. A machiya is a traditional Japanese house that can be very atmospheric and are thus increasingly popular with tourists visiting Japan. Indeed, I briefly considered staying in one during my trip to Kyoto last year with Templeton Peck and Vicious Alabaster. But, unless they’ve been extensively renovated, they can be very impractical buildings – stiflingly hot in summer, frigid in winter, outhouses, floorplans that seem bafflingly alien to Westerners and paper-thin walls that let your neighbours hear everything. And they’re not even that cheap. All of that makes Machiya an inauspicious name for a Kanada-ya spin-off concentrating on Japanese comfort food. Tonkatsu, Japanese curry and yakitori are often ignored or done in a horrifically slipshod manner by most Japanese restaurants in the West. But in Japan they often receive just as much due care and attention as more ‘high-status’ dishes. If it had gotten everything just right, then Machiya could’ve helped give these cruelly underappreciated dishes a much higher profile. 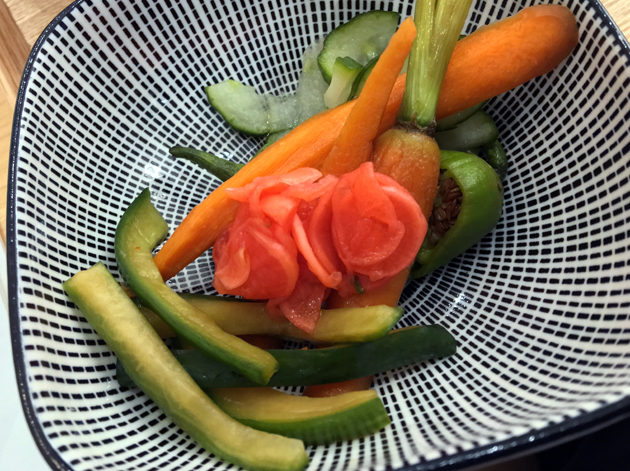 Unfortunately, Machiya frequently misses the mark – starting with the menu. Although not anywhere as voluminous as the menus at most catch-all, do-everything Japanese restaurants in the West, its relative length was the first sign of trouble. With Japanese food, less is inevitably more. Tonkatsu might seem like nothing more than a thicker form of schnitzel, but that doesn’t do this deep-fried dish justice. At its best, it can be a beautifully crispy, unctous, tender and meaty delight with few peers. 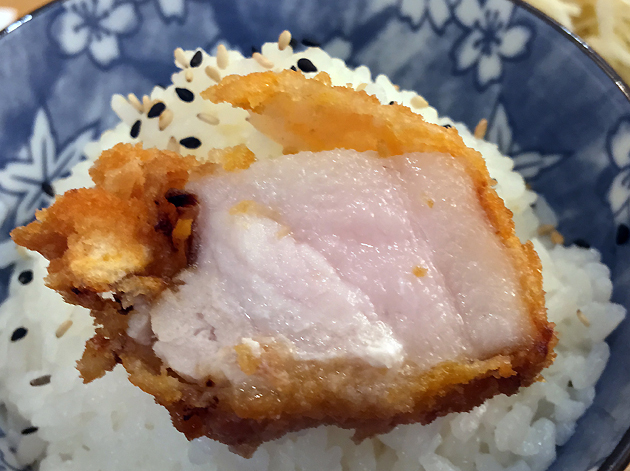 Unfortunately for us Londoners, Machiya’s pork tonkatsu doesn’t come anywhere close to this Home Island standard. 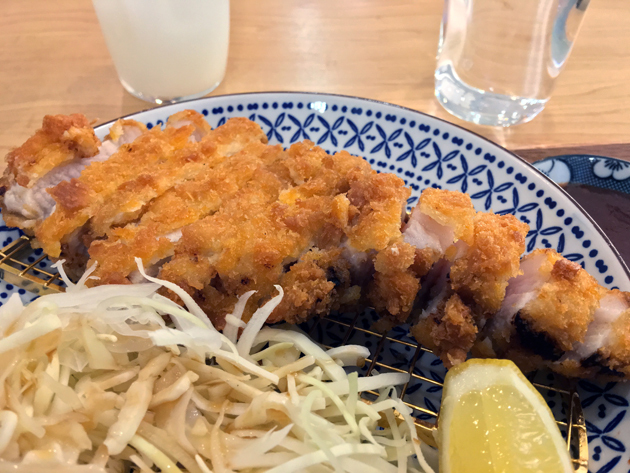 For a start the crunchy crumb exterior, while not bad in its own right, paled in comparison to the feathery, etherally fluffy crispiness of the best tonkatsu in Japan. The meat underneath was the picture of inconsistency – excessively fatty at one end, nothing but hard and unyielding white meat at the other. It’s a very pale imitation of the mind-alteringly good tonkatsu I had at Tonkatsu Santa in Tokyo. Even the mirin-drizzled cabbage was too hard. 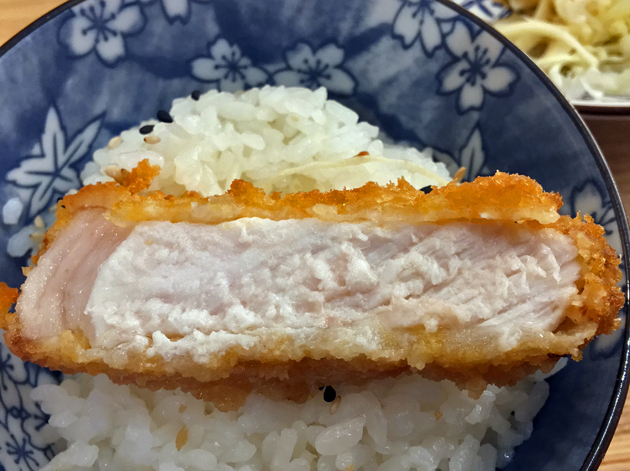 You don’t even get rice with your tonkatsu, but at least the optional stuff on the side was respectable – small grained, fluffy and soft. A surprisingly generous helping of chicken arrived when I ordered the yakitori, but that hardly makes up for its almost complete lack of resemblance to the yakitori ideal. 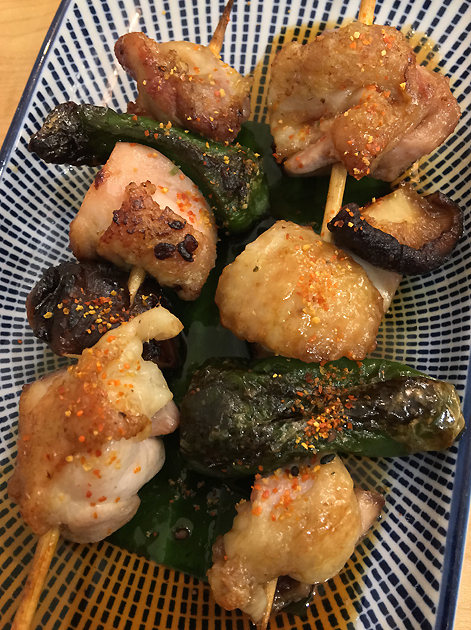 The skewered meat tasted like chicken stewed in soy – its unremarkable taste and mouthfeel were a world apart from the smoky, uniquely textured delights that are taken for granted in Japan and are so frustratingly elusive in London. There is some pleasing crockery at Machi-ya. At least the pickles were a delight. 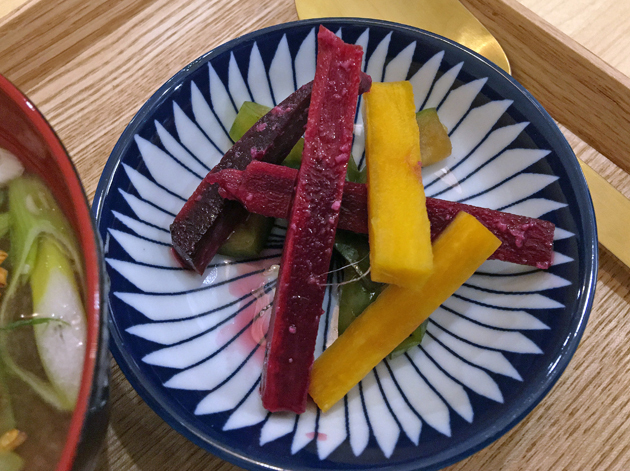 Ranging from sweet and vineagry to peppery then fruit sweet, this bowl of crisp veg was the closest London rendition yet of Japan’s superlative pickling arts. 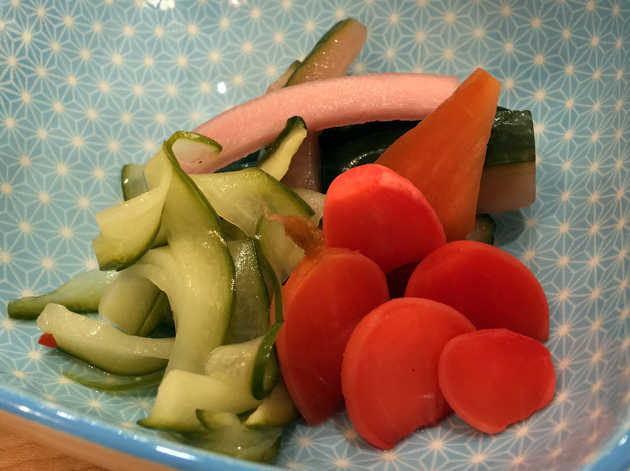 I’m slightly obsessed with Japanese pickles and I’m not going to apologise for it. 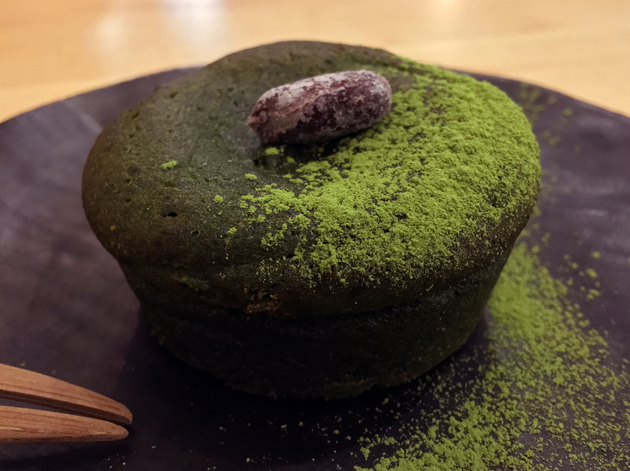 Almost all of Machiya’s desserts are child-sized. 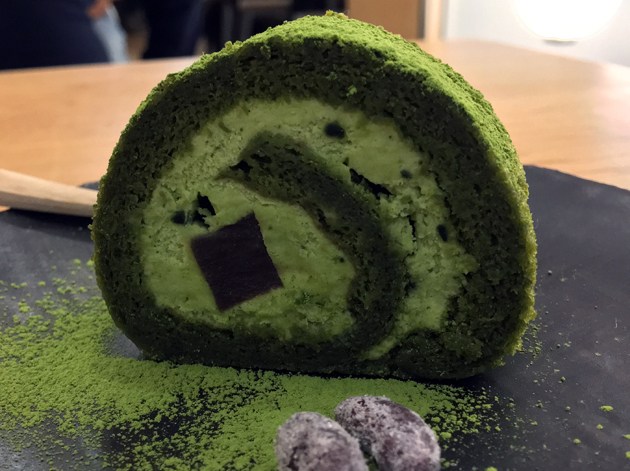 At least this meant I could get the matcha roll cake with adzuki beans over and done with. Everything from the green tea flavour of the sponge to the adzuki-flavoured gelatine cubes dotting the cake tasted limp and apologetic. 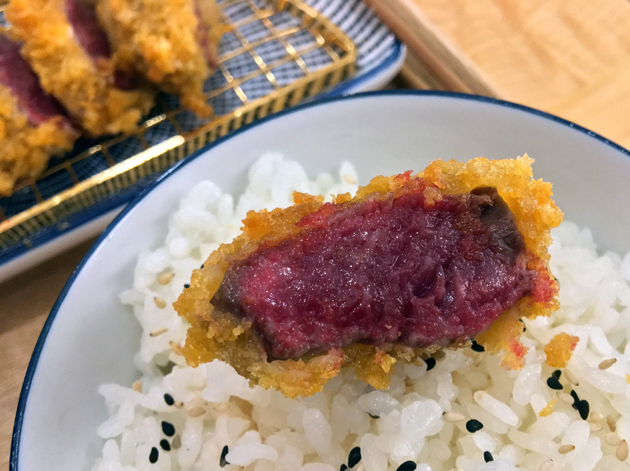 Despite its ostensible focus on cheap and cheerful Japanese comfort food, Machi-ya couldn’t help but offer a far pricier and much smaller version of the pork tonkatsu with wagyu beef in place of pig. Although the batter was crisp, it was difficult to appreciate this given that the necessarily small portion of beef, designed to keep the price palatable, also meant proportionally smaller slices and thus commensurately teenier slithers of batter. 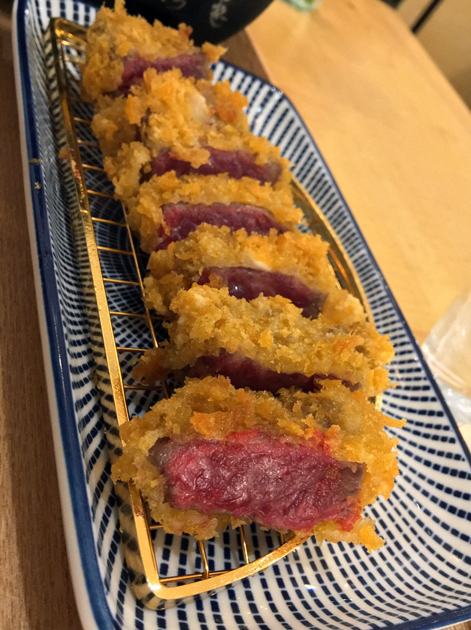 Despite my initial scepticism over the use of the placebo-like, oligarch-magnet, influencer-fooling fodder that is wagyu, Machi-ya’s choice of beef turned out to be surprisingly seductive. Distinctly sweet and tender, yet dense and yielding, it didn’t need any extra searing on the provided hotplate, never mind the wasabi and brown sauce dipping condiments on the side. As with the pork tonkatsu, rice isn’t included. 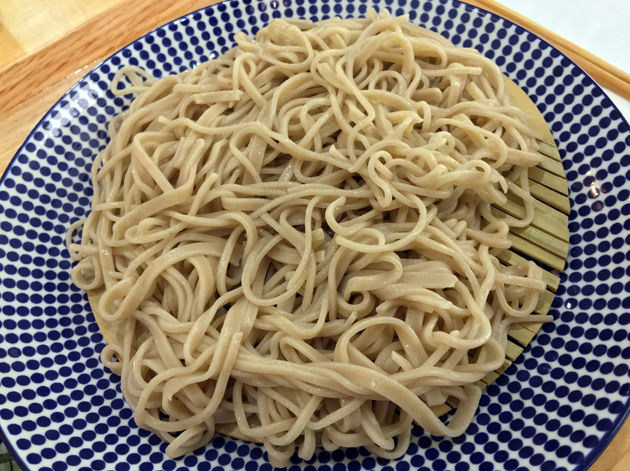 You could, in a bout of heresy, opt for chilled zaru soba as your source of carbs instead of rice. I wouldn’t recommend it though. Not because I’m against unusual combinations of food, but because the noodles were so deeply underwhelming. Flat-surfaced on each side, the strands were oddly bland and lacked the subtly nutty moreishness that I’d expect from buckwheat. At least there was some sweet mirin and umami wakame on the side to soften the blow. Yes, zaru soba is supposed to be served chilled or at room temperature. 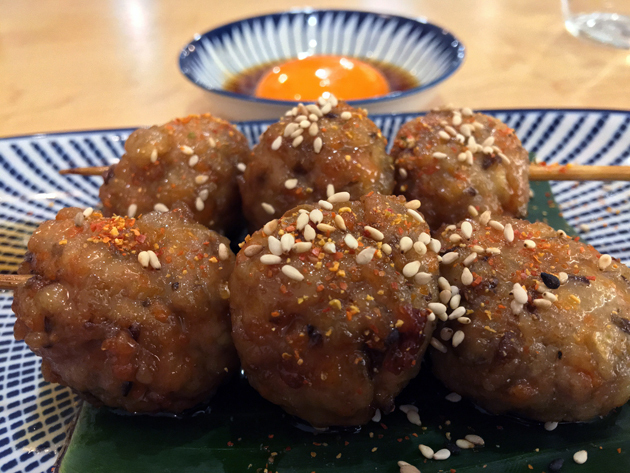 The minced chicken meatball, or tsukune, was surprisingly decent following the disappointment that was the chicken yakitori. Meaty, yet also smooth and moist, it proved to be a fine conveyor for a dash of nutty sesame, lightly spiced togarashi and a runny, relatively rich egg yolk. Egg yolk served on the side. The pickles were just as good as they were before, albeit with the addition of some uninspired and insipid carrots. Soft serve matcha ice cream avoided the pitfalls of most green tea-based desserts, managing to be neither bitter nor oily. 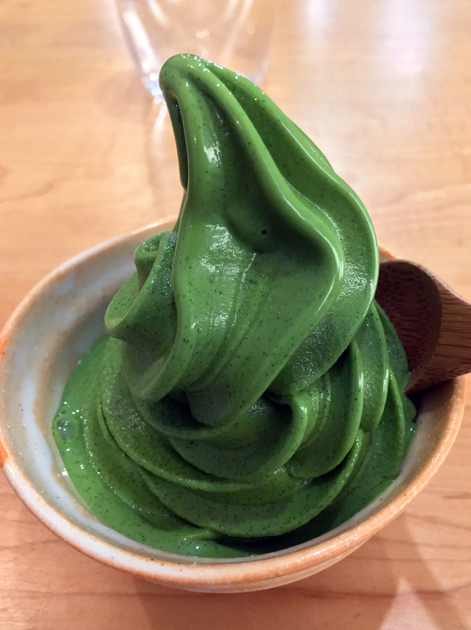 The reasonably strong matcha flavour came in a confection that was smooth and bracingly cold. This ice-cream had a quiff. Although decent enough, the matcha ice cream wasn’t the dessert I was most looking forward to at Machi-ya. Warabimochi is rarely seen outside of Japan. 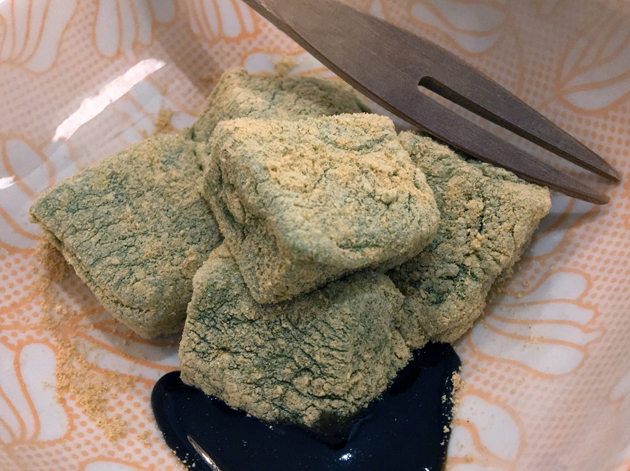 When it is, this dessert – made of gelatinous, processed starch and dusted in toasted soya flour – tends to be the preserve of haute cuisine kaiseki and kappo ryori restaurants. 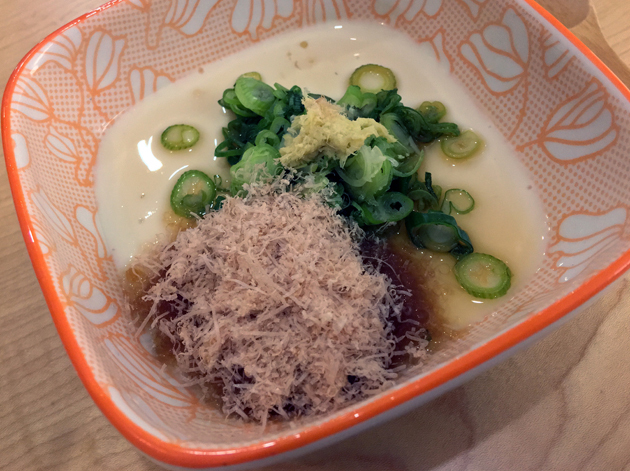 Machi-ya’s version wasn’t quite as gummy and stridently nutty as the version I had in Kyoto. It was much softer and goopier – almost liquid-like in places – and tasted much sweeter, with an almost tea-like tannin-ish quality. 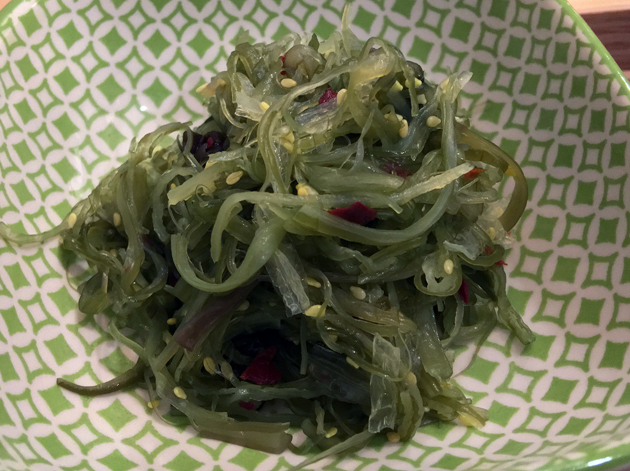 None of this meant Machi-ya’s warabimochi was bad – far from it. If anything, this version will likely prove far more palatable to most Londoners than the comparatively esoteric version I had at Sagatoufuine in Kyoto. A dessert that wouldn’t get many likes on Instagram. ‘Tofu custard’ is basically Kryptonite if you’re a culinary conservative. Tofu! Yuck! Only hippies eat that! Tofu custard! Ewwww! High falutin’ cheffy chuff! Give me some honest meat and two veg! The reality was much more mundane and wasn’t as norm-threateningly bizarre as one might think, but it was also not nearly as good as I would’ve hoped. The smooth and refreshingly cool ‘custard’, akin to a savoury creme brulee without the crackling, served as a neutral-tasting conveyor for ginger, spring onions and the caramelisation-like sweet meatiness of the Chinese-style pork floss. Although not nearly as good as the superlative tofu dishes of Kyoto’s Sagatoufine, it was still perfectly enjoyable. If someone describes pork floss as ‘Asian pulled pork’, I will wrench out their eyeballs and use them as stress toys. 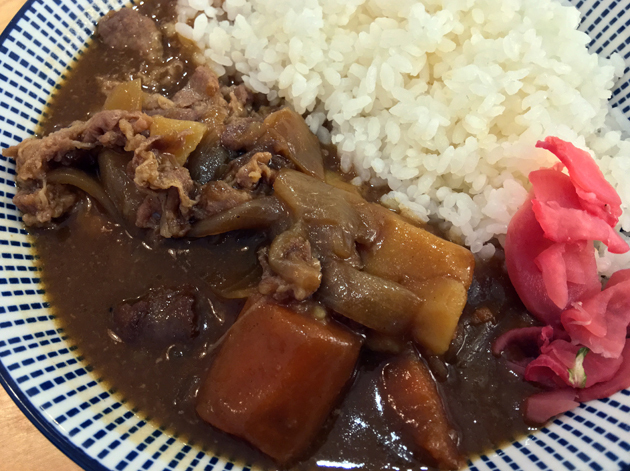 Japanese-style curry is more closely related to the chip shop condiment than it is to the delights of India, with the Japanese adopting the dish from us in one of those weird little quirks of history. The version here, from a Westerner’s perspective, was more like a stew than an archetypal curry. The sauce was gently sweet and almost treacly, while the tenderised strips of sinewy beef were ribbed with gelatinous connective tissue. There wasn’t enough of either the beef or of the softened root vegetables. Even when counting the included rice, this was a surprisingly small main – especially considering the plentifully sized versions of this dish elsewhere. 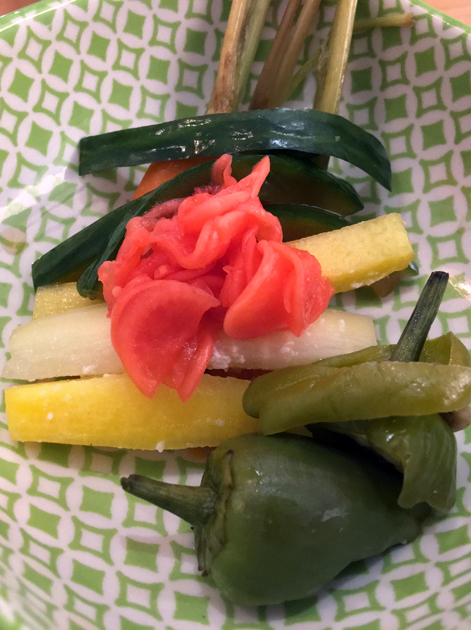 The constituent vegetables in the selection of Japanese pickles continued to vary, but the general decline in quality and quantity was noticeable with markedly less distinctiveness in every bite. Pickles. Vegetables that tunnel-vision carnivores will actually eat. 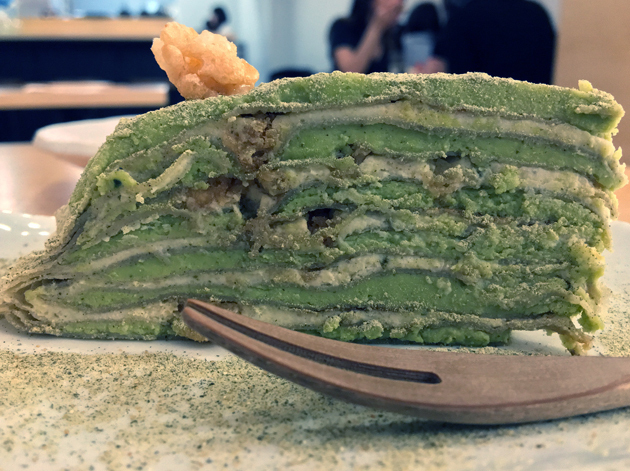 The matcha ‘mille crepe’, or stacked crepe cake to you and me, will gain a legion of fans for its appearance alone. It’s actually not a bad dessert – alternating layers of soft fluffy crepe and cream provided an amusing contrast in texture. The crepe’s taste of matcha was joined by a hint of nuttiness which proved to be a pleasing combo, even if it could’ve been bolder and more strident. 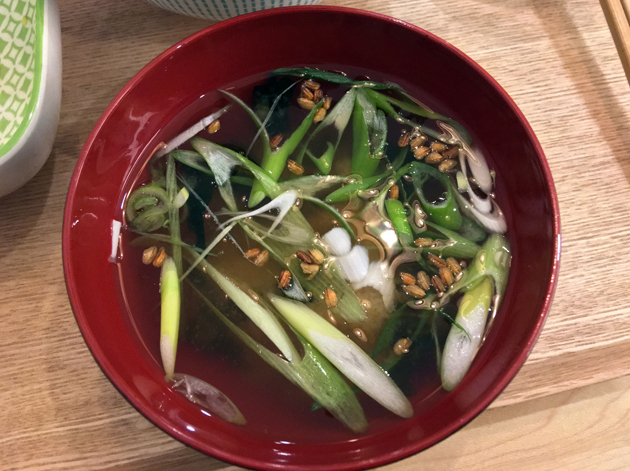 Machi-ya’s miso soup had a pleasing level of umami once I had worked my way through all the crisp spring onions and nutty, chewy seeds needlessly scattered on top. 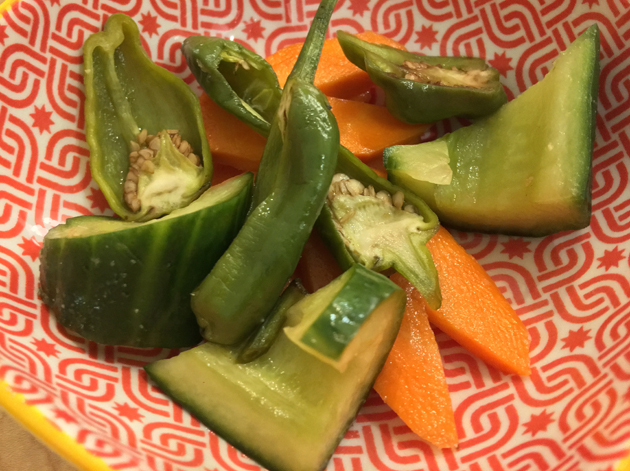 Alongside it was a small selection of pickles, the quality of which benefitted from the focus that smaller portion sizes tend to bring. The sweet, earthy and vinegary selection was a beauty to behold once again. Chuka salad was just a vaguely exotic-sounding name for spiralised bits of sweet, citrusy vegetables in a nutty sesame dressing. Chuka some of that my way. 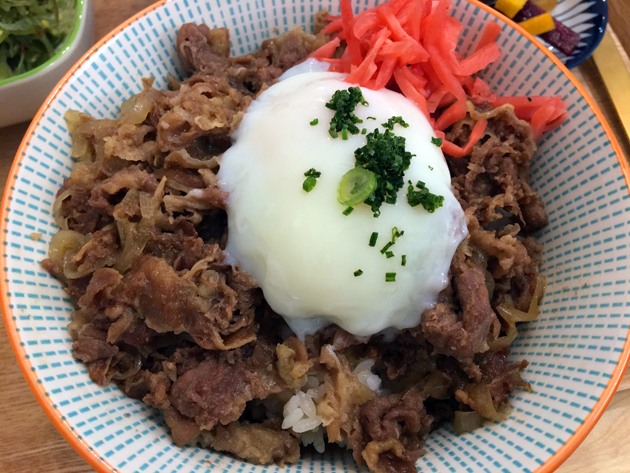 Gyudon is one of those dishes that’s ubiquitous in Japan, to the point that it’s become cheap ¥300-ish fast food in many cities, but is uncommon in London. Here, thin slices of beef had been simmered to a tender and moreish state, enhanced further by a rich and runny egg, and tinged with garlic. Soft, fluffy rice was included as was a heap of pickled ginger. Although the latter is an integral part of the dish in Japan, I felt its strident zing detracted from the comforting combo of beef and rice. 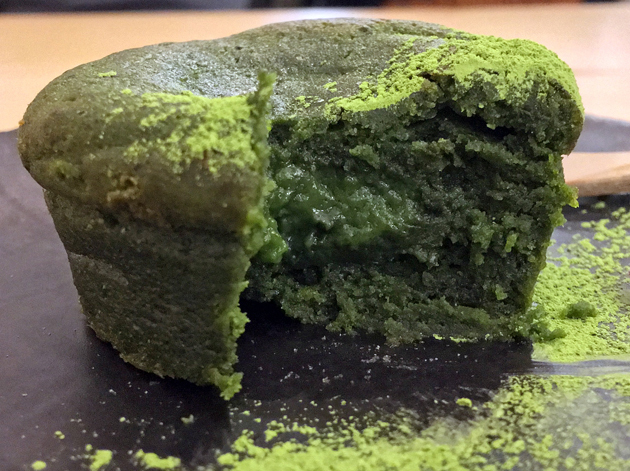 ‘Matcha fondant’ turned out to be a soft, almost molten chocolate cake that tasted less of meh chocolate and more of matcha. Although small, its was nonetheless pleasing thanks to its tea-derived tannic tang. Cupcake sized. A bit smaller, actually. The pickles continued to yo-yo in quality, leaving my hankering for a reliable supply of quality Japanese pickles unfulfilled. Now they’re not even trying. 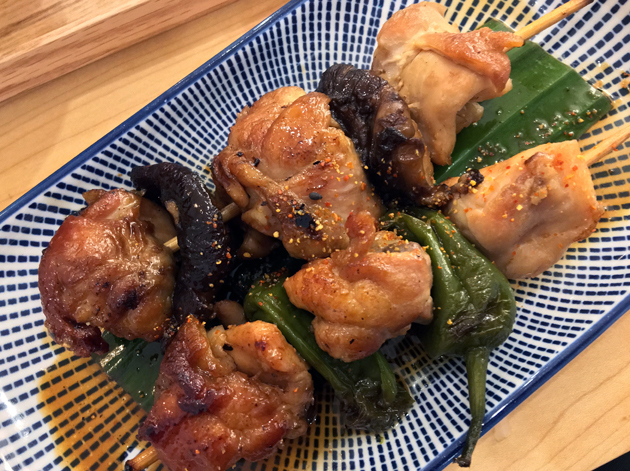 Chicken yakitori wasn’t quite as leaden as it was before, but it was still little more than stewed soy chicken on skewers – a far cry from the smoky, distinctively textured delights of proper yakitori. 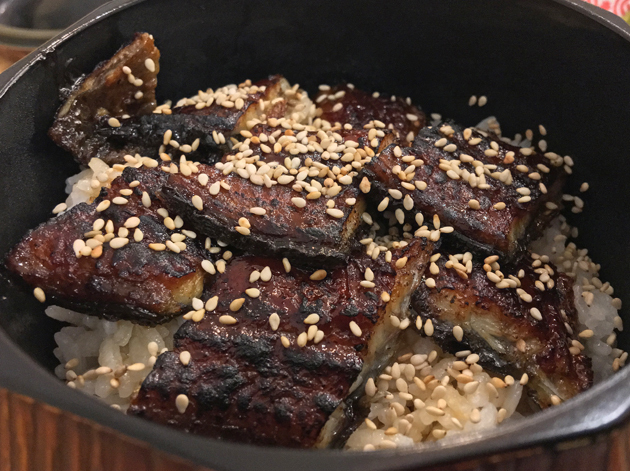 Grilled eel with rice, or unagi don, is one of the most expensive dishes on Machi-ya’s menu, alongside the wagyu tonkatsu. It wasn’t good enough to justify such premium pricing though. The eel was a bit too soft, almost to the point of mushiness, while its glaze had a one-note soy quality to it that was lacking in sweetness and umami. It didn’t even look especially appealing, with not enough glossy consistency in the glaze to give it the alluring lacquer-like sheen that makes unagi don look so alluring. At least the small-grained rice was consistently soft and fluffy across all my visits. I had high hopes for Machi-ya as it’s from the same people behind the rightly lauded Kanada-ya. Sadly, those hopes are dashed – the food here is highly inconsistent in quality, with some bright spots lost amidst a sea of mediocrity. This is a shame as the idea behind Machi-ya’s menu is laudable. Gyudon, tonkatsu and yakitori, among many others, are Japanese comfort food classics that deserve far greater recognition and enjoyment in Britain than they currently receive. In a better world, the likes of Wasabi and its ilk would serve cheap and cheerful gyudon rather than a seemingly endless menu of tired chicken in your choice of mucus-like sauces. It’s a sad state of affairs indeed when a restaurant manages to take much of the ‘comfort’ out of comfort food. Opening Hours: Monday-Saturday noon-23.00 and Sunday noon-22.00. Tags: beef, cake, crepe, crepes, curry, custard, green tea, gyudon, ice cream, kanada-ya, london, machi-ya, machiya, meatballs, miso, noodles, pickles, pork, restaurant, review, soba, soup, tofu, tonkatsu, wagyu, warabimochi, yakitori. Bookmark the permalink. I’m not infallible, but it tasted like pork floss to me and not bonito or itogaki.